The event began with 23 entries in a “Burridge Swiss” format to determine the 16 players to qualify for the Finals Knockout. Players had 10 rounds in which to win 5 games and qualify for the knockout or lose 6 games to be eliminated and be eligible for the Plate event. As soon as a player qualified or was eliminated, they ceased playing in the Swiss. The knockout was best-of-3 for the round of 16, the quarter finals and the semi-finals. It was a best-of-5 for the final. There were no surprises in the round of 16 players, but Jenny Clarke (the top seed) was the only one of the top four seeds to reach the semi-finals. In the first semi-final, Jenny beat Nick Chapman (SA) quite quickly 26-10, 26-3. In the other semi, Alison Sharpe (NSW) and Alan Sands (WA) played their hearts out over almost a full day with both players having chances to secure a win in the match. Ultimately it was Alison who won 21-15, 23-24, 26-20 and reserved a place in the final. The best-of-5 final was very exciting. Alison Sharpe won the first game against Jenny Clarke in a very close encounter 26-22. This was the first time that Alison had ever beaten Jenny. There were some tough battles after this but Jenny proved too strong as the match went on to win the next three games 26-14, 26-0, 26-20. Alan Sands won the playoff for 3rd place beating Nick Chapman 6-26, 26-12, 26-4. The Z event (5th place) was won by Jeff Newcombe (WA) over Trevor Bassett (NSW) 26-9, 26-10. The Y event (9th place) was won by Chris Grant (Victoria) over Murray Baum (SA) 24-20, 25-9. The W event (13th place) was won by David Johnston (Victoria) over Kerri-Ann Organ (Victoria) 22-8, 21-13. The Plate was won by John Arney (SA) with 5 wins from John Piggott (NSW) with 3 wins in the 6-player round robin. The AB Morrison Trophy for a player on a high handicap who won the most games over the whole event was won by John Piggott (NSW). 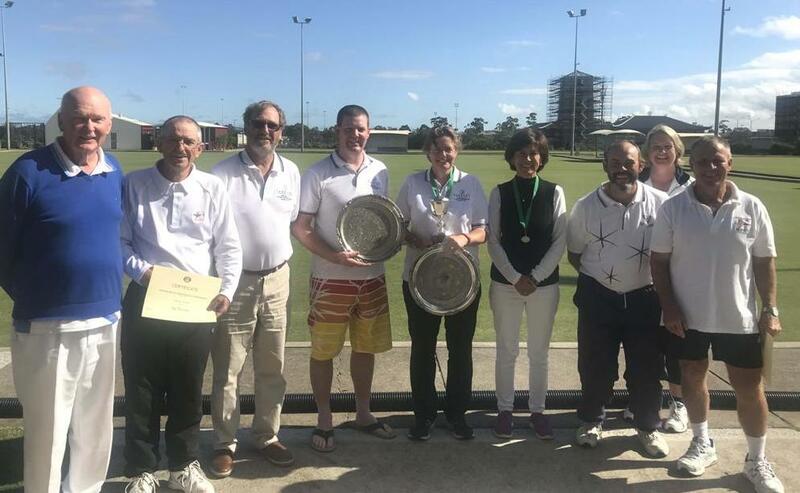 Placegetters, from left: David Johnston (Vic), Jeff Newcombe (WA), John Arney (SA), Trevor Bassett (NSW), Jenny Clarke (NZ), Alison Sharpe (NSW), Chris Grant (Vic), Kerri-Ann Organ (Vic), Alan Sands (WA). A very big thank you to the sponsors Parbery Consulting, for providing prize money, arranging and cooking a BBQ during the Singles, and giving a commemorative shirt to each player. The complete set of results for all games can be found on Croquetscores at https://croquetscores.com/2018/ac/aust-singles. There are also commentaries on the 2nd, 3rd and 4th games of the final at that web site. Very many thanks to Brian Reither for managing the event. And thanks to Mike Cohn and his team of referees for their very professional contribution to the tournament – particularly on the two or three very wet and cold days. It was recognized and much appreciated by the players. Also, thanks to the players for clearing the courts for mowing, and moving and setting hoops for the knockout play. It was great to see everyone chipping in.